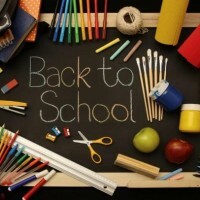 Theme Ride Thursday: Are You Ready for Back to School? It’s that time of year again! The one children dread and the one parents love—Back to School! We’ve got two profiles ready for use and we’ve added plenty of new songs to our back-to-school playlist that’ll help you get back into the swing of alarm clocks, carpools, and after-school activities. Your riders will have a blast with these two profiles! This profile contains four climbs of varying length, steepness, cadence, and intensity. While the underlying training purpose is to work on climbing muscles and the cardiovascular system, the outward focus is to simply have fun with the music (Ferris Bueller, anyone?) while working pretty dang hard! The music is a mix of genres with folk, indie, R&B, pop, punk, retro, and classic rock. It also spans the school age, from kindergarten and elementary, to high school and on up to college. And if your students aren’t all parents there is one thing we have in common…we all went to school, and all likely have some fun, crazy, embarrassing, and poignant memories. And so do you! This ride was put together by ICA member, Billy Coburn, one afternoon while perusing his Facebook feed showing “Julie/Johnny on their first day of school”— with placards in hand announcing what grade they entering. Billy took the ICA’s extensive Back to School playlist and decided to poke some fun and give it a shot. The end result was quite surprising and super fun for all involved. Plus, it’s an intense workout! Download both of these profiles below. Our playlist has 165+ songs! Some are pro-school (“Be True to Your School”), some are anti-school (“Another Brick in the Wall”), some are about the awkwardness of being a teenager (“Awkward”), some are about teacher-student relationships (“Don’t Stand So Close to Me”) or student relationships (“We’re Gonna Be Friends”), some are about the crazy things school kids do (“Smokin’ in the Boy’s Room”) and some are just a plain mockery of school (“Fight For Your Right”). And can we just talk about how awesome this remix is featuring the kids of Oakland and Marshawn Lynch? Click the images below to download the PDF files. There’s ano Eicc Prydz mix of this which comes in with an RPM in the low 60’s….would work really well with this profile I think?